Founded in 2008 by Kevin Shovich, the Orange County Paintless Dent Company is family-owned and operated out of Winter Park, FL, just north of Orlando and has proudly been serving the dent removal and repair needs of all of Greater Orlando and Orange County for more than 8 years. We have been in the dent removal industry since 1996 and have been working with dealerships, body shops, auto auctions, rental car accounts and the citizens of Orlando ever since. What does this experience mean to you? It means we have seen it all and you can trust your car is in good hands with us! The quality of our work is guaranteed and we will treat your car like it is our own, because we pride ourselves on being one of the best paintless dent removal services in Orlando. Since we opened our doors in 2008, we have treated every customer like they were a part of our family and we have taken great pride in the dent repair services we provide. Other companies might offer similar dent removal services, but our services are the best because they come with experience and our personal touch. We are proud to offer the convenience of our mobile service to all of our customers in Seminole and Orange Counties. Mobile dent repair services include but are not limited to Orlando and outlying areas like Kissimmee, Ocoee, Sanford, Goldenrod, Bay Lake, Oviedo and more. Click to view more areas we serve in Orange County and Seminole County. 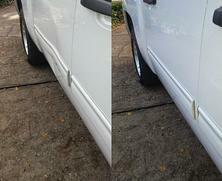 We offer free estimates and always give a fair price for our quality dent repair services. Let the convenience and quality of our services help you with your dent repair today. I started Orange County Paintless Dent Company after 10 years of working for Dent Wizard International. I passed the highest level of training in the company by reaching four star paintless dent repair and hail damage status, an unprecedented accomplishment. I have taken everything I learned about dent repair and removal throughout my career and applied it here because I knew I could provide quality repairs with the personal touch customers deserve. I can assure you, if the job can be done outside a body shop... it will be done! Committed to providing our customers speedy solutions and quality service!